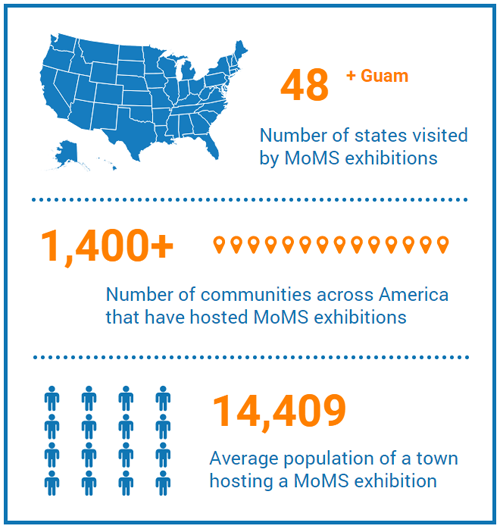 In towns across America-probably one near you-there’s a Museum on Main Street (MoMS) exhibition opening at a local museum, library or community center. Since 1994, Museum on Main Street (MoMS) exhibitions from the Smithsonian have been designed specifically for use in small museum settings and in rural communities. Covering topics of broad national interest such as sports, food traditions, work history, among other themes, Museum on Main Street exhibitions are between 500 and 800 square feet in size, free-standing and include objects in cases, interactive components, and audio and video presentations. Supporting materials include marketing tools, lesson plans, and training manuals. Museum on Main Street exhibitions are designed to be a spring board for local exhibitions and complementary humanities programming. Often, the visitor count to our exhibitions exceeds the population of the towns where they are on display. For example, in Jerome, Arizona (population 400), there were 2,800 people who visited the exhibition, or in Brimley, Mississippi, (population 1,214), nearly 8,500 attended exhibition events. In short, state humanities councils and area museums contribute their own considerable expertise and can-do spirit to make Museum on Main Street exhibitions a must-see destination in counties and communities across the U.S. and its territories.